New international agreements with universities in Geneva, Italy, and Japan will provide Colgate students with exciting new ways to expand and deepen their educational opportunities both on campus and abroad starting in 2019. A five-year joint AB-MA program with the Geneva-based Graduate Institute of International and Development Studies (IHEID) now offers students the ability to earn a bachelor’s degree from Colgate and a master’s degree from the Graduate Institute. Students selected for this program will take three years of courses at Colgate and then spend the fall semester of their senior year in Geneva, home to United Nations agencies and myriad other international institutions and nongovernmental organizations. Following commencement, they will return for one year to IHEID to complete their master’s degree. Another new agreement between Colgate and Ca’ Foscari University of Venice deepens a long-standing relationship between the two institutions, as Colgate has hosted Italian language interns from Ca’ Foscari for many years. Associate Professor of Italian Monica Facchini led discussions with Ca’ Foscari to develop a new agreement that solidifies an opportunity for students in the Venice Study Group to take classes at the venerable Italian institution. In addition, the agreement helps further connect the two schools as the Colgate professor leading the study group each year will be named as a visiting scholar at Ca’ Foscari; this year, Facchini is teaching Colgate students and seven Ca’ Foscari students in her Intro to Italian Cinema class. “I feel this is the best way for our students to learn from their peers in Ca’ Foscari, feel more at home, and hopefully make new friends,” Facchini said. 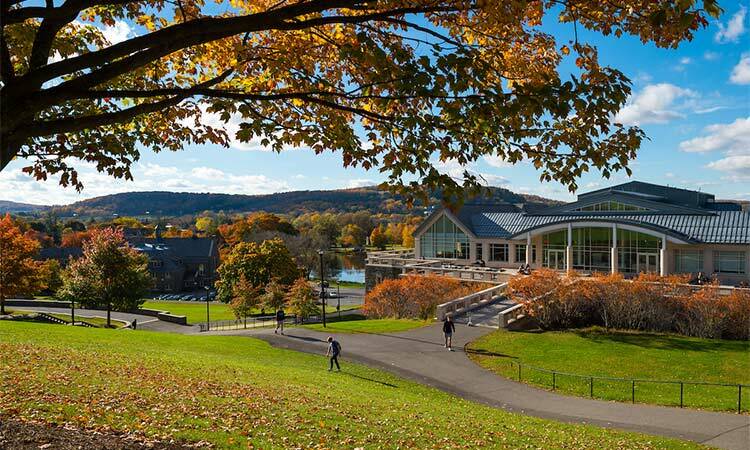 A third agreement with Tsuda University in Japan, led by Professor of Japanese and Director of Colgate’s Linguistics Program Yukari Hirata, guarantees the placement of a Japanese language intern at Colgate each year for the next five years. Tsuda has worked with Colgate for many years to assist with language instruction interns, and this agreement now formally recognizes the partnership for the next five years.